Friday Eve once again. How yous gonna celebrate? I’ll probably celebrate by going to work, working, coming home, going to bed, waking up on Friday. Yeah, that’s what Ima gonna do. The man standing next to her you would assume is her husband, when actually it is another guy that she cheated with. the doctor says “Mr. Cline, get ready to assume this is yours” because they don’t know whos child it is, the man’s or Mr. Cline’s. Then Mr. Cline walks in. I feel stupid, but I think I’m missing something integral to the joke. Yeah, not getting this one. I don’t understand… am I missing something? 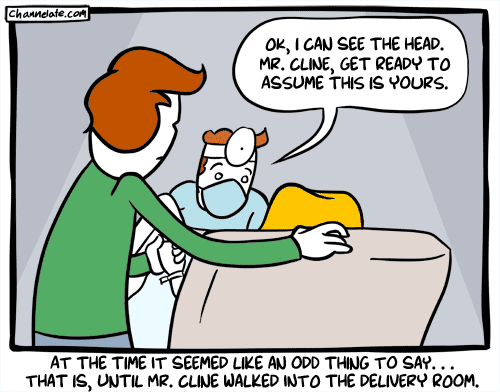 I think it’s because the doctor thought the guy was the dad, and the baby didn’t look like him. And then the dad walked in. Me neiter. These 2 are a pair. The women is giving birth to her child, with a guy standing next to her you would assume beeing her friend, most probably the father. But there is still Mr. Cline to show up. Dont know much about this Mr. Cline guy, but it seems like he is regulary identifieing children as its own. Okay, I think I get it…. Oh, I think I get it: it’s not funny. the only thing i don’t get is how you guys don’t get it. This is a classy joke. George Purdy you ain’t classy. Care to explain it, then? I saw “Mr. Cline” as the title on Reddit and my heart jumped. I thought it was Morpheus. The joke is in the description below the picture. The guy in the picture probably wasn’t Mr. Cline. The woman probably was pregnant with one of the two guys she hangs out with. But she didn’t know which one is the real father. So she called both of them… but one of them arrived late. The baby is black, as is Mr. Cline. CASE CLOSED.